Abdul Gaddy was somewhat of a disappointment considering he's the lone player on the team with actual college basketball experience. He blended into the background and took a back seat to his far more talented guard counterparts from the high school ranks, seeing only four minutes in the final game. Gaddy has nice size and a good frame, but he just isn't athletic enough to make his presence felt at this level. He struggles to turn the corner, rarely gets to the basket and usually uses the pick-and-roll to set up mid-range jumpers. Gaddy doesn't push the ball in transition. He looks hesitant and lacks creativity in the half-court, instead looking content to make solid plays. Gaddy does run a team pretty effectively. He moves the ball around on the perimeter in fundamental fashion and finds the open man unselfishly. He can make shots from the perimeter and looks competitive on the defensive end. It really wasnt until the private scrimmage we took in the day before the actual game that we were actually fully able to distinguish what makes Abdul Gaddy (#9 Scout, #13 Rivals, #16 ESPN) such an interesting long-term prospect. Once we got a chance to see him run a team for an extended period of time, though, it became extremely obvious what the recruiting services see in him. Gaddy is an incredibly rare prospect, as hes a pure point guard with very nice physical attributes and an excellent framework of skills to build off of. Those three things combined put him in a very unique class, which really gives him a chance to develop into a special player down the road. Once you learn that hes just 17 years old and also brings outstanding intangibles to the table, its very easy to figure out why hes deemed to have such great potential. The difference a single year makes between the age of 17 and 18 is absolutely huge from a physical and maturity standpoint, which is why Washington fans have to be incredibly excited. Although he doesnt appear to be a freakish athlete on first glance, Gaddy is an exceptionally smooth player who already seems to show solid ability to utilize changes of speed and hesitation moves. His body is very underdeveloped at the moment, which affects him first and foremost as a scorer (finishing around the basket primarily) but considering the fact that his ball-handling skills are sound with either hand and he shows potential both as a set-shooter from beyond the arc and with his mid-range pull-up jumper off the dribble, he should be able to develop this part of his game in time. His main virtue, though, lies in his ability to see the floor with his excellent size, and get everyone around him involved creatively, looking highly unselfish and showing a very nice feel for the game for a player his age. He plays at his own unique pace, which you typically dont see from 17-year old guards. Gaddys biggest drawbacks at the moment revolve around his defense and his very laid back demeanor. Like a lot of west coast players, Gaddy looks a bit too relaxed at times, not showing much of a killer instinct and being somewhat deferential. This could be a product of his youth, but there may be some that question whether hes just a little too nice. Very much related is the lack of intensity he displays on the defensive end, getting outmuscled with ease due to his lack of strength, and not really trying to do much about it. Washington was a much improved team defensively this year, and hopefully Gaddy will be able to get better on this end of the floor as well over the next few years as well. As you will hear in the interview below, Gaddy is at least a two-year prospect at the University of Washington due to the fact that he wont turn 19 until his sophomore season. As you will also notice, Gaddy seems to have a great head on his shoulders, as everyone that knows him likes to emphasize. It will be exciting to see how he fits in next season alongside the very undersized and very ball-dominant Isaiah Thomas, who Gaddy indicates below he knows very well from the Seattle basketball scene. 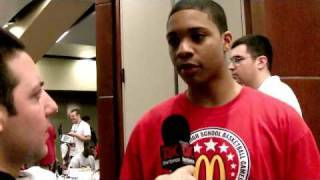 Widely considered the second best point guard prospect in the 2009 class, we didnt get as much of a chance to evaluate Abdul Gaddy (#9 Scout, #14 Rivals, #14 ESPN) as we may have hoped. Gaddy looks to be a very smooth, but somewhat raw point guard who plays the game at a very nice pace. He has great size for the position, a low center of gravity, and a lot of shake to his game. He throws in all kinds of nifty hesitation moves to keep his defender off-balance, and shows the ability to knock down shots from the perimeter with a high arch and feathery touch, pull-up off the dribble, finish with a floater, or create for others on the drive and dish. He utilizes the pick and roll well and looks very unselfish, although he still needs to learn the nuances of the game from what we could see of him going up against the top guards in this class. He alternated between looking a little too much for his shot and then being extremely passive, deferring late in the game and not showing the willingness to step up when his team needed a basket. Well see a lot more of him down the road we imagine.